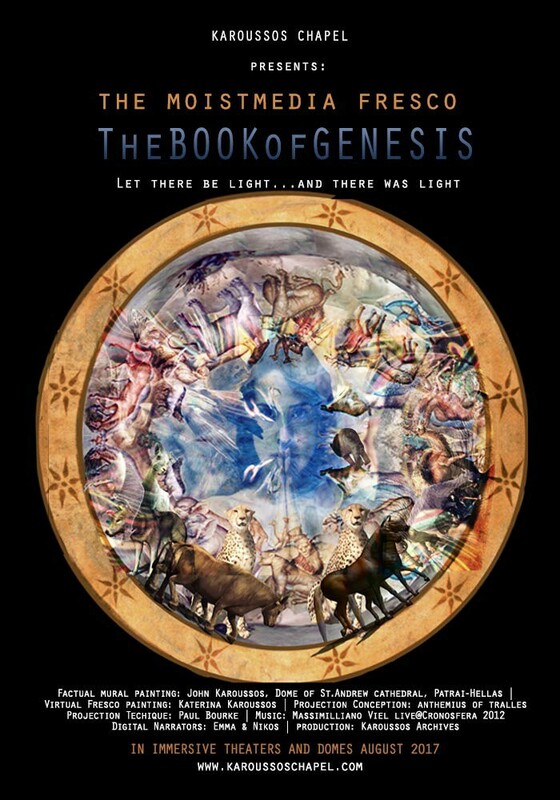 The ethereal fresco of The Genesis has been created through enhanced painting technique, i.e. a projected fresco whose elements are enriched through moistmedia – i.e. the informative media that include both validated (monumental) and virtual (enhanced) reality. The process uses layers of existing frescoes from Karoussos Archives, blended with new entries such as motion and sound, thus defining a new framework that can ensure and validate its ultimate expression of the art of immersion and transcendence. These hybrid frescoes create the same organic reaction as this of the wet plaster in frescoes back in the 12th century. Through moistmedia though, the fresh layer of lime is diffused through the emerging artwork and together with the light, embraces the spectators, achieving their absolute immersion while they are becoming a part of the fresco’s virtuality. Moistmedia frescoes are projected according to a lateral staggering way of viewing, a Byzantine technique, by which can translate the space in a lateral manner, as the gaze revolves around the hemisphere and rebounds, without losing the viewing angle throughout the entire periphery. is an artist and a Doctor of Philosophy in ‘Theōria’. She studied Fine Art at the Athens School of Fine Arts and Byzantine Art under her father, Iannis Karoussos. She holds a Masters from Middlesex University and a PhD from Plymouth University under Roy Ascott. Karoussos has participated in many international conferences and has published in many academic journals . Apart from her artwork as a mural painter in Orthodox churches, she has participated in many international exhibitions (Athens, Japan, New York, Frankfurt, Montenegro, Cuba, etc.). Through ‘Theōria’, her academic and artistic work, she succeeded in shifting the Byzantine expressionist visuality to a Byzantine augmented virtuality. is an International Conference designed to use art as a catalyst to explore intersections between NATURE, SCIENCE, TECHNOLOGY and SOCIETY as we move into an era of both unprecedented ecological threats and transdisciplinary possibilities.